Every Thursday thousands of shraddhavans throng at Shree Harigurugram to take part in the upasana (community prayer) and take darshan of the Sadguru. Starting with arrival of Vishnupad from Sainiwas, Shrimad Purushartha Grantharaj is also carried to the venue, taken to the stage in a Palakhi (palanquin) in a Dindi procession. Later, the idol of Shree Dattatreya, which is worshiped at Sadguru Bapu’s residence, arrives. Shraddhavaans get an opportunity to shower flowers at idol of Dattatreya and the Granthraj. The upasana begins after the worship of Shree Dattaguru. The Shree Shabda Dhyaan Yog Upasana was considered to be the highest during Vedic times. The students at Gurukuls were taught this upasana. Sadguru Bapu has started this ‘Shree Shabd Dhyaan Yog’ at Shri Harigurugram for benefit of all shraddhavans. Swastikhsem Samvaad means to talk to the Shree Chandikakul. We can express our emotions to Chandikakul during this Samvaad. After all the upasanas, either Bapu himself speaks or some of the old discourse CDs of Bapu on various subjects are played at Shree Harigurugram. Know more here. 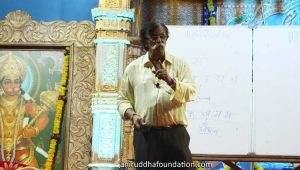 The discourses are followed by aartis like “Durgey Durghat Bhari”, “Aarti Saibaba”. Later after the completion of darshan again aarti’s like “Durgey Durghat Bhari” and “Om Sai Shri Sai Jai Jai Sairam” are sung. As announced by Sadguru Shree Aniruddha, under the ‘13 Point Program’, old newspapers, fodder, cotton thread, old clothes are donated here by Shraddhavans which are later distributed to the needy for free. Click here to know more about other “Devotional Services”. Devotees can participate in various devotional activities at Shree Harigurugram. One can worship Shree Trivikram during Sukhasavarni Prayer, or enjoy the Satsang,, have prasadam, offer Dhoop, Sudeep, Tripurari Trivikram Garland, etc. 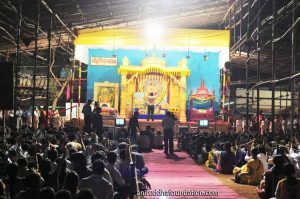 Most of the festivals organized by Shree Aniruddha Upasana Foundation and allied organizations like – Gurupournima, Shree Aniruddha Pournima, Shree Dhanalaxmi Poojan, etc. are celebrated at Shree Harigurugram. Apart from these, many programs like Shree Aniruddha Chalisa Pathan, Mega Blood Donation Camp, Charkha Shibir are also organized here.